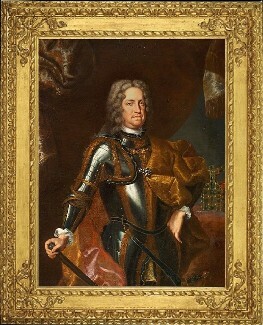 Charles VI (1 October 1685 – 20 October 1740; German: Karl VI.) succeeded his elder brother, Joseph I, as Holy Roman Emperor, King of Bohemia (as Charles II), King of Hungary and Croatia (as Charles III), and King of Serbia, Archduke of Austria, etc., in 1711. He unsuccessfully claimed the throne of Spain as Charles III following the death of its ruler, and Charles's relative, Charles II of Spain, in 1700. He married Elisabeth Christine of Brunswick-Wolfenbüttel, by whom he had his two children: Maria Theresa, born 1717, the last Habsburg sovereign, and Maria Anna, born 1718, Governess of the Austrian Netherlands. Following the death of Charles II of Spain, in 1700, without any direct heir, Charles declared himself King of Spain—both were members of the House of Habsburg. The ensuing War of the Spanish Succession, which pitted France's candidate, Philip, Duke of Anjou, Louis XIV of France's grandson, against Austria's Charles, lasted for almost 14 years. The Kingdom of Portugal, Kingdom of England, Scotland, Ireland and the majority of the Holy Roman Empire endorsed Charles's candidature. Charles III, as he was known, disembarked in his kingdom in 1705, and stayed there for six years, only being able to exercise his rule in Catalonia, until the death of his brother, Joseph I, Holy Roman Emperor; he returned to Vienna to assume the imperial crown. Not wanting to see Austria and Spain in personal union again, the new Kingdom of Great Britain withdrew its support from the Austrian coalition, and the war culminated with the Treaties of Utrecht and Rastatt three years later. The former, ratified in 1713, recognised Philip as King of Spain, however, the Kingdom of Naples, the Duchy of Milan, the Austrian Netherlands and the Kingdom of Sardinia – all previously possessions of the Spanish—were ceded to Austria. To prevent a union of Spain and France, Philip was forced to renounce his right to succeed his grandfather's throne. Charles was extremely discontented at the loss of Spain, and as a result, he mimicked the staid Spanish Habsburg court ceremonial, adopting the dress of a Spanish monarch, which, according to British historian Edward Crankshaw, consisted of "a black doublet and hose, black shoes and scarlet stockings". 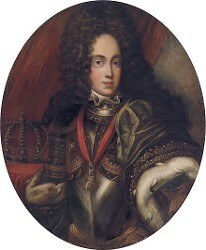 Lack of sons irked Charles and eventually led to the promulgation of the Pragmatic Sanction of 1713, a document which abolished male-only succession (hitherto effective in all the Habsburg realms except for Hungary, where Charles only succeeded to get it approved in 1723) and declared his lands indivisible. The Emperor favoured his own daughters over those of his elder brother and predecessor, Joseph I, in the succession, ignoring the Mutual Pact of Succession he had signed during the reign of his father, Leopold I. For the next twenty years, Charles sought approval of the Sanction from the other European powers. They exacted harsh terms: for instance, Britain demanded that Austria abolish the Ostend Company. In total, Great Britain, France, Saxony-Poland, the Dutch Republic, Spain, Venice, States of the Church, Prussia, Russia, Denmark, Savoy-Sardinia, Bavaria, and the Diet of the Holy Roman Empire recognised the sanction. France, Spain, Saxony-Poland, Bavaria and Prussia later reneged. For a short time, however, it seemed that the Pragmatic Sanction was gratuitous, when Elisabeth Christine gave birth to a baby boy in 1716. But he died soon after. A year later, Maria Theresa, his elder surviving child, was born. Contemporaries wrote that at her baptismal ceremony, Charles, despite his best efforts, appeared upset at the child's gender. The next year saw the arrival of another girl, Maria Anna. 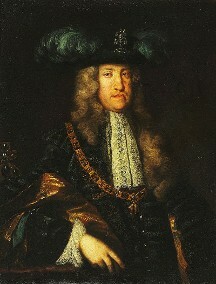 Charles was successful in the Austro-Turkish War of 1716–18, adding Banat to Hungary, and establishing direct Austrian rule over Serbia and Oltenia (Lesser Wallachia). This extended Austrian rule to the lower Danube. In 1722, Charles founded the Ostend Company to augment Austria's trade with the East Indies, West Indies and Africa. The charter was for a period of thirty years. The Austrian exchequer was to receive between 3 and 6 percent of its annual surplus. The Company competed with British and Dutch interests, and in the Treaty of Vienna (1731), he dissolved the Company in exchange for Britain's recognition of the Pragmatic Sanction. Peace in Europe was shattered by the War of the Polish Succession (1733–1738), a dispute over the throne of Poland between Augustus of Saxony, the previous King's elder son, and Stanislaw Leszczynski. Austria supported the former, France the latter; thus, a war broke out. By the Treaty of Vienna (1738), Augustus ascended the throne, but Charles had to give the Kingdom of Naples to Don Carlos, in exchange for the much smaller Duchy of Parma. The issue of Charles' elder daughter's marriage was raised early in her childhood. She was first betrothed to Léopold Clément of Lorraine, who was supposed to come to Vienna and meet Maria Theresa. Instead, he died of smallpox in 1723, which upset Maria Theresa. Léopold Clément's younger brother, Francis Stephen, then came to Vienna to replace him. Charles considered other possibilities (such as Don Carlos) before announcing the engagement to Francis. 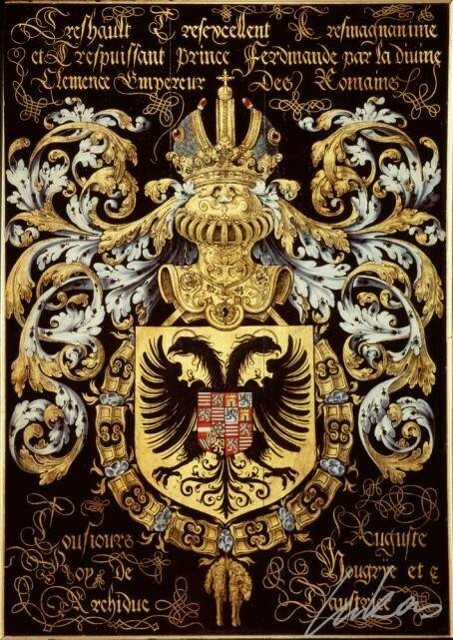 At the end of the War of the Polish Succession, France demanded that Francis surrender the Duchy of Lorraine (his hereditary domain), to Stanislaw Leszczynski, the deposed King of Poland, who would bequeath it to France at his death. Charles compelled Francis to renounce his rights to Lorraine and told him: "No renunciation, no archduchess." Francis complied; he was married to Maria Theresa in February 1736, and Lorraine devolved to Stanislaw in July 1737. 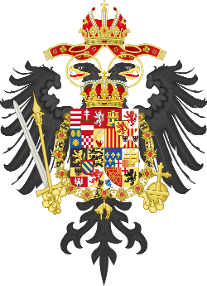 Full titles of Charles as the emperor and ruler of Habsburg lands as well as a pretender to the Spanish throne went as follows: Charles, by the grace of God elected Holy Roman Emperor, forever August, King in Germany, of Castile, Aragon, Leon, both Sicilies, Jerusalem, Hungary, Bohemia, Dalmatia, Croatia, Slavonia, Rama, Serbia, Galitia, Lodomeria, Cumania, Navarra, Grenada, Toledo, Valencia, Galicia, Majorca, Sevilla, Sardinia, Cordova, Corsica, Murcia, Jaen, the Algarve, Algeciras, Gibraltar, the Canary Islands, the islands of India and Mainland of the Ocean sea, Archduke of Austria, Duke of Burgundy, Brabant, Milan, Styria, Carinthia, Carniola, Limburg, Luxemburg, Gelderland, Württemberg, the Upper and Lower Silesia, Calabria, Athens and Neopatria, Prince of Swabia, Catalonia, Asturia, Margrave of the Holy Roman Empire, of Burgau, Moravia, the Upper and Lower Lusatia, Princely Count of Habsburg, Flanders, Tyrol, Ferrette, Kyburg, Gorizia, Artois, Landgrave of Alsace, Margrave of Oristano, Count of Goceano, Namur, Roussillon, Cerdagne, Lord of the Wendish March, Pordenone, Biscay, Molina, Salins, Tripoli and Mechelen, etc.